Hardly returned from her adventure at the southern state Afghanistan, Lenna was absent at a sad ceremony, the funeral of an Estonian corporal Agris Hutrof (1986-2011), on October 22nd, 2011. He was killed on a firefight with militants during a NATO operation on October 15, 2011. The decision to fight with a gun always requires courage, bravery and an absolute obedience of orders. Corporal Agris Hutrof understood it fully, General Laaneots said about the lost soldier and adds: He was a model soldier and a comrade always ready to help his fellows. Also the Estonian president Toomas Hendrik Ilves said a few words in honour for such an important man. The beginning of his speach was: Corporal Agris Hutrof fell for Estonia. Estonia takes care of the world’s safety. Estonia wants to believe in us, her citizens, and wants us to be ready to come to rescue her, when the proper day arrives. 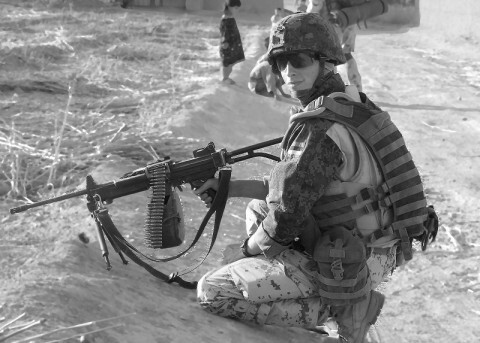 The Corporal Hutrof fought for his and our country’s security, in the widest meaning of that term. He fought so each one of us could live peacefully without the fear of past horrors’ repetition. Lenna was invited to sing at the funeral, she sang the famous Estonian song Tõuse Üles Ja Läheme Ära (Engl. : Rise And Let’s Leave) we can see that the Vanilla Ninja girl was really worn out as Hutrof was a part of ESTCOY12 unit quartering in Wahid, which was visited by her before the tragedy happened.